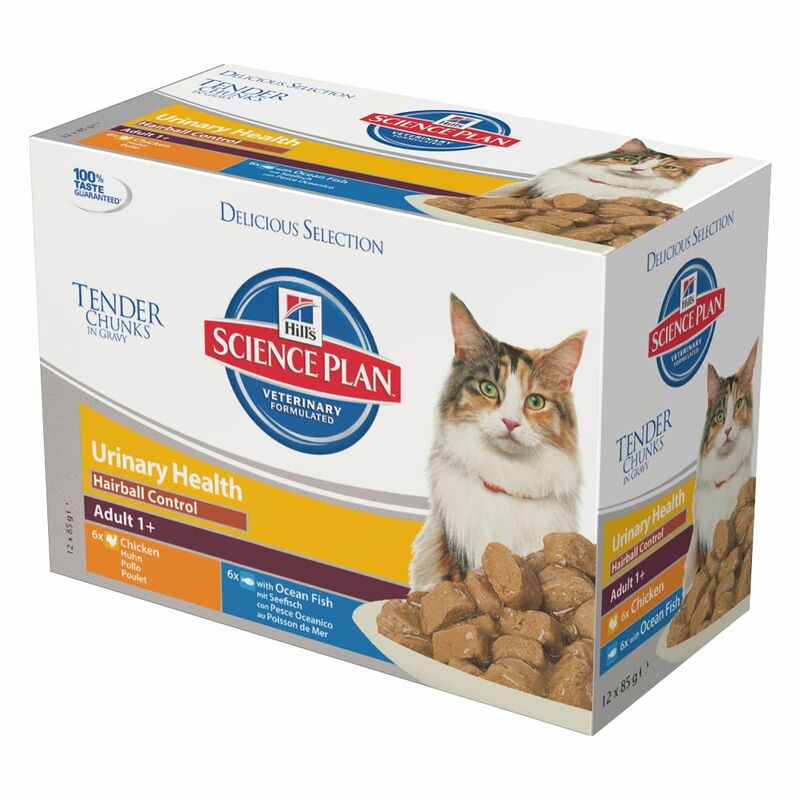 Hill's Science Plan Adult Urinary and Hairball Control Pouches offer your cat a balanced diet for adult cats. This complete, wet food contains tender chunks of poultry or fish in gravy, which appeals to even the fuΒiest cats. These cat food pouches also help to prevent urinary infections from developing and also helps to prevent the formation of hairballs. Many cats have the tendency to develop urinary infections and should be fed a prophylactic diet. Healthy kidneys also play an important role in your cat's overall wellbeing, as they cleanse blood from waste products. This wet food by Hill's has an adjusted mineral content, which helps to support healthy kidney function. Your cat's urinary health is also supported with this adjusted mineral content. Hill's Science Plan Adult Urinary and Hairball Control Pouches helps to promote urinary health from the kidneys to the bladder, and contains the perfect combination of vitamins, minerals, energy and protein to keep your cat healthy. This wet food is particularly suitable for long-haired cats, as the natural plant fibres help to prevent the formation of hairballs and promotes healthy digestion. Wet food also plays an important role in keeping your cat hydrated, which also helps keeps the urinary tract healthy. Hill's Science Plan pouches are free from artificial flavours, colours and preservatives. Hill's Science Plan Adult Urinary and Hairball Control Pouches contains the following varieties: 6 x Chicken 6 x Ocean Fish Hill's Science Plan Adult Urinary and Hairball Control Pouches at a glance: Complete wet food for adult cats aged 1-6 years old Helps to prevent urinary infections: supports urinary health from the kidneys to the bladder Tender chunks in gravy: delicious meat or fish appeals to even the fuΒiest of cats Balanced nutrients: the perfect combination of vitamins, minerals, energy and protein Adjusted mineral content: supports healthy kidney function Prevents the formation of hairballs: natural fibres help to promote the natural paΒage of hair Ideal for long-haired cats Hydration: wet food hydrates your cat and keeps the urinary tract healthy Free from artificial flavours, colours and preservatives.